There are so many thirst quenching finds to enjoy during these hot months. Fruit slushies, smoothies, flavored waters, lemonades, and many more. 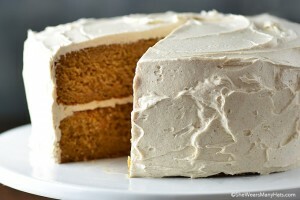 Plus, it’s fun to have a special something on hand for all the cookouts and summer get-togethers coming up. I’ve been bookmarking and printing out recipes left and right myself. I thought I’d do a quick round up of a few I’ve posted and a list of other tasty ones for you to check out. Get your straws ready and make sure you have plenty of ice. Enjoy! 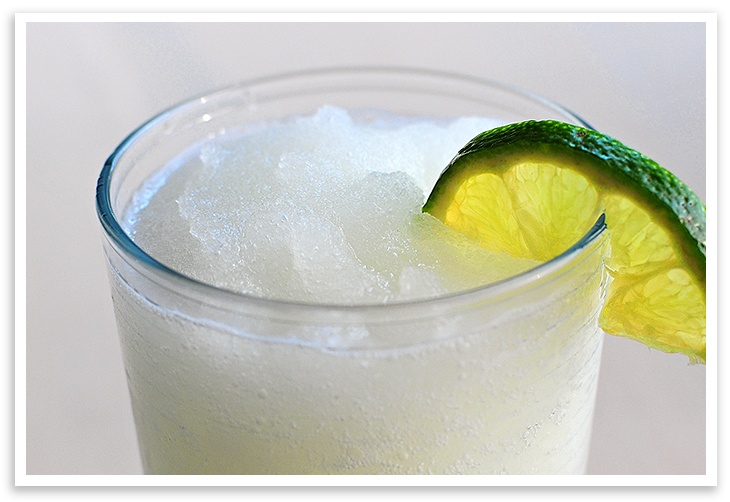 A recent post for a Frozen Coconut Limeade. Two ingredients plus ice. Doesn’t get any easier than this folks–or tastier! The recipe provides for a non-alcoholic version too. 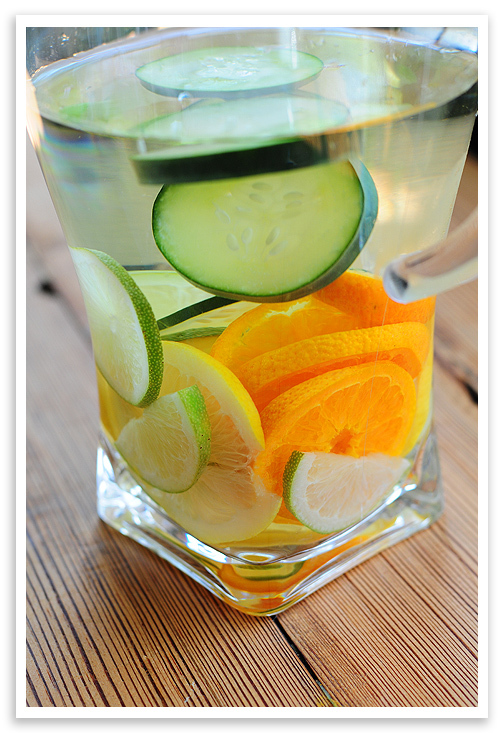 Super-dee-duper easy Flavored Water. Have a gallon or two on hand for a quick and light drink. This recipe for Cherry Limeade is an all natural, no preservative option full of flavor. Give it a whirl in a blender for a slushy version. A Rhubarb Strawberry Smoothie that could be easily switched up using different fruit combos. A little healthier than a milkshake too. See? What did I tell you? And that’s just a sampling of what’s out there on the internets. Be sure to visit my friend, Cheryl, over at TidyMom, and her “I’m Lovin’ It!” weekly series for many fantastic ideas and inspiration. « Previous PostA friendly reminder. Ah, there’s nothing like a cool, refreshing drink on a hot summer day…and I think all of these drinks would do the trick. I say – bring on the summer! I want every.single.drink on this post! Especially the coconut limeade…heaven! Great list. Thank you for allowing my drinks to be part of such a wonderful round up! I really, REALLY want BOTH of your limeades! Now. All great choices Amy. I love just having water with fresh lemons and limes when guests come over; it’s so simple but they all feel so special. Like at a spa! Perfect timing on this post……I’ve been craving some refreshing summer drinks! Now I’m super-d-duper thirsty! And thanks for including my spritzer in your offerings!! Lovely Round Up! thirsty just looking at it! Amy, thanks for putting these all in one place. I’m bookmarking your page and visiting the other blogs from here. Looks like I’ve got quite a few drinks to try out this summer! This is a wonderful round-up! And thank you for highlighting the elderflower syrup, I just love beverages. Love all these fun ideas!! How have I missed that Cherry LImeade? It’s one of my favorite drinks in the wide world!! All I need to go along with these drinks is a lounge chair, sun and sand. Every one looks more delicious than the next. Love this collection of summer drinks – I’ll be referencing this to switch things up with the weather getting so hot! So many tasty beverages! The best part of summer. for sure! I’m a summer drink fanatic. Love my smoothies so much better than milkshakes!